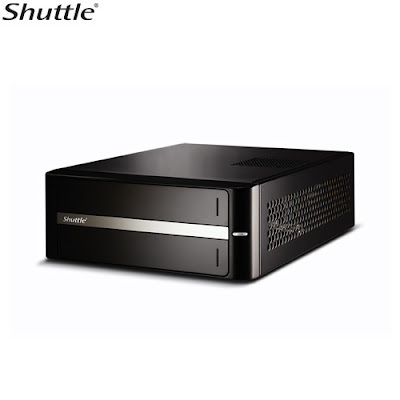 The latest addition to the Haunt is the Shuttle X27, a tiny Intel Atom-based box with an external 60 watt power supply. Like BEAST, it is all black, but with a tasteful silver highlight on the front. With all the other PC's and laptops floating around the place, one might usefully ask, "why?" There are of course two answers - "Not because we must, but because we can" and an invocation of Bell's Law - "There are only two reasons to buy things - your friends already have it, or your friends don't have it"
The Shuttle X27 as built, uses a mini-ITX motherboard with an Intel Atom 230 CPU, 2 gigs of memory, and a Hitachi 2.5" 500gb SATA drive. Everything is designed to be low power and passively cooled. Ironically, it is the Northbridge chipset that requires a fan, but this is inaudible. The case is heavy steel, perforated on the sides and top. The drive interface is SATA, but can only accommodate a laptop drive. I chose not to put in a slim DVD drive, as I prefer to rip on the main PC using dbPoweramp. I used an external USB DVD drive to load the Vortexbox ISO image downloaded from the site and burned to a CD. It installed automatically, just asking for the time zone and a root password. After installation, the box can run headless - no keyboard, mouse or display required. Instead, access is by web browser and invoking the IP address. The administration GUI is clean and simple, with icons for each of the major tasks. Squeezebox Server looks exactly the same as it does under Windows. The current release of Vortexbox is 0.9, and after installation, I only had to configure Squeezebox Server and change the Workgroup name under SAMBA (I did this by editing the smb.conf file, but the option to change is actually available from the GUI) in order to be visible with the rest of my Windows PC's. Since Slim Devices has just updated Squeezebox Server to 7.4.1, I ran the Vortexbox update routine, which connected to the Internet and downloaded 120 updates from the Fedora and Vortexbox repositiories. The final job was to move all my FLAC files over to the Vortexbox. This was accomplished with a simple drag and drop - and about 5 hours of waiting to move the 240gb of data. It is hard to describe how simple and painless the whole process of creating this music server turned out to be. I am no Linux geek, and the only questions I had were answered in the FAQ and/or some quick googling. The result is a small, low power, near silent, music server running SqueezeBox Server and supporting 5 Logitech Slim Devices units (two SqueezeBox 3, one Boom, one Transporter, and one Duet). Of course, you can also just play music by navigating to the FLAC directory on the Vortexbox and using Winamp or similar software.